Coachella Valley Music & Arts Festival has officially wrapped its colossal weekend one affair with a star-studdered night in the desert. The Goldenvoice-produced mega-festival saw celebrities all over Indio Valley, whether it was on stage or roaming the grounds taking their obligatory ferris wheel photos. Night three, in particular, always seems to be the most talked-about night as invited artists pull out the most shocking collection of surprise guest appearances during the prime time slots. 2019 was certainly no different. Ariana Grande brought out a full posse of guests on stage, in typical Coachella headliner fashion. marshmello made his rounds of surprise appearances during past collaborators’ sets, Khalid and CHVRCHES, respectively. Major Lazer was the DoLaB surprise set, while NGHTMRE closed out the festival with A$AP Ferg and Lil Jon. Here are the top highlights of weekend one, day three at Coachella 2019. Also, read our day one and day two re-caps for more pertinent Coachella 2019 highlights from weekend one. Ariana Grande became the voice of the Millenial generation on Sunday, as if she wasn’t already before. That was the resounding response to her amazing turn-out to close out the Coachella mainstage on April 14. Having to follow up Beyoncé‘s history-making performance last year would be enough to intimate even the strongest of pop queens, but let’s not compare apples to oranges. Ariana Grande proved, even amidst mourning the late Mac Miller, that she could not only handle the torch but that she could walk the entire line. The star cameo appearances didn’t stop there as “Mo Money, Mo Problems” began to play with Grande picking up the song’s melody. Immediately, the crowd knew Diddy was going to make his way out, but they were also hopefully anticipating some sort of Tupac-adjacent hologram appearance from the late Notorious B.I.G. alongside him. Instead, Mase came out to sing Biggie’s parts and he did not disappoint. The song was said to be a tribute to the three late rappers: Tupac, Biggie, and Mac Miller, respectively. 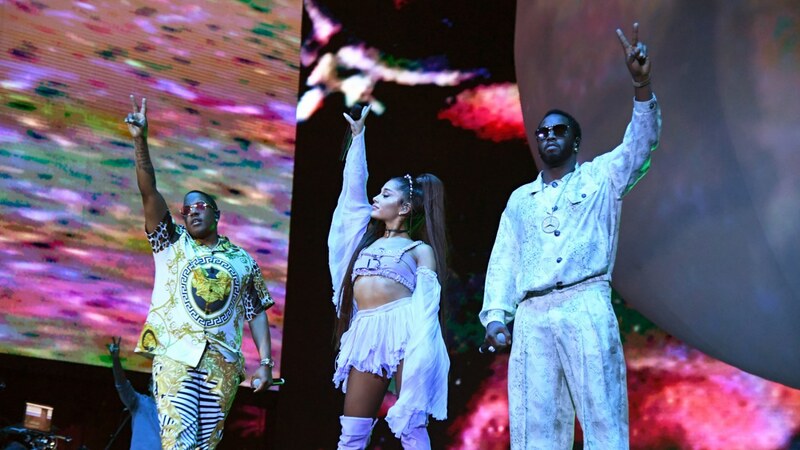 Diddy ended the high-profile guest song with a poignant message: “Y’all give it up for Ariana Grande. She’s going through a lot right now and she still showed up for y’all,” he said, referencing Grande’s Grammy debacle and the loss of her ex-boyfriend, Miller. It created an especially awkward scene for Minaj, who stated, “We can’t hear anything” to the sound engineering booth. But Grande continued to sing and rally behind Minaj, who appeared mortified. The show, as they say, must go on. A known gay icon and outspoken LGBTQ supporter, Grande then ended her set with the Rainbow flag flying across the Coachella main stage’s massive LED screens. The move was thought a giant middle finger to AEG owner, Philip Anschutz, whose donated massive sums to support anti-LGBTQ organizations over the years. Katy Perry surprised fans with an on-stage appearance on night three, joining producer and recent touring partner Zedd as he took to the main stage at sunset. 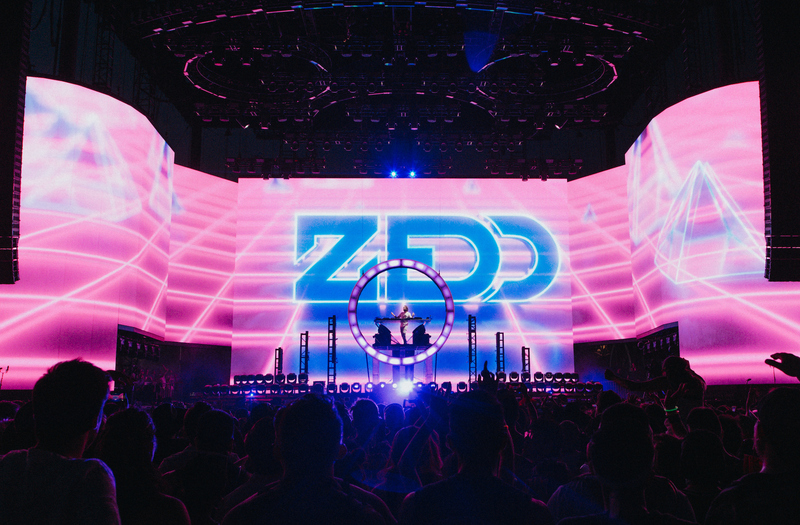 Zedd’s set was chocked full of all his greatest hits, including his many pop collaborations with the likes of Selena Gomez, Hailey Steinfeld, Alesia Cara, Elley Duhe, Maren Morris, and so many more. Over across the valley, French techno god Gesaffelstein was giving the Outdoor stage a deep dive into his darker sound by emblazoning a more thinned-out Coachella crowd with material off his newest LP, Hyperion. His sophomore studio album, which marked his signing with Columbia Records, was released only last month, so what better place for him to debut some of the music live for the first time ever. Of course, Gesaffelstein has just played Coachella two years ago, but not with brand new music, which has decidedly taken techno into a more rampant, commercial direction. He dropped his collaborations with The Weeknd and Pharrell, playing over two mirrored DJ decks in vastly stoic appeal. His movements were minimal and controlled, so as to match the uniqueness of his sound, as black-and-white visuals played across the screen, along with smoke adding a mysterious dimension to his performance. What stole the show, as well as what added an even more mysterious allure to his personae, was Gesaffelstein’s shiny, new garb. He rocked the stage in a custom-made Blamain look, made personally by Parisian designer Olivier Rousteing. Complete with a metallic mask that entirely covered his head, the techno producer conjured up stark Daft Punk images in people’s minds. Make no mistake, the headgear was a bold new move meant to mimic the aesthetic of his sophomore album, making the album’s artwork come to life in his live performance. Then, in another bold and wildly-eccentric move, a door opened up onto the backstage and Gesaffelstein was seen turning around and merely walking off. No words, only strong, statement-making actions. It was almost as if he’d given his crowd the old “Irish Goodbye.” Powerful, nonetheless. Of course, it wouldn’t be a good ole’ commercial time at Coachella without the bucket head making an appearance. Pop icon marshmello made not one, but two appearances during the prime time slots of Sunday evening. First, Khalid invited marshmello onto the stage when the smiling R&B star began in with “Silence,” the pair’s recent collaboration. The two showed off great chemistry, with Khalid’s feel-good vibes matching the candy-pop tones of marshmello, who inexplicably had a mic in hand for some reason or another. Khalid also brought Halsey, rising star Billie Eilish, and Normadi during his main stage performance, which would also mark his Coachella debut. 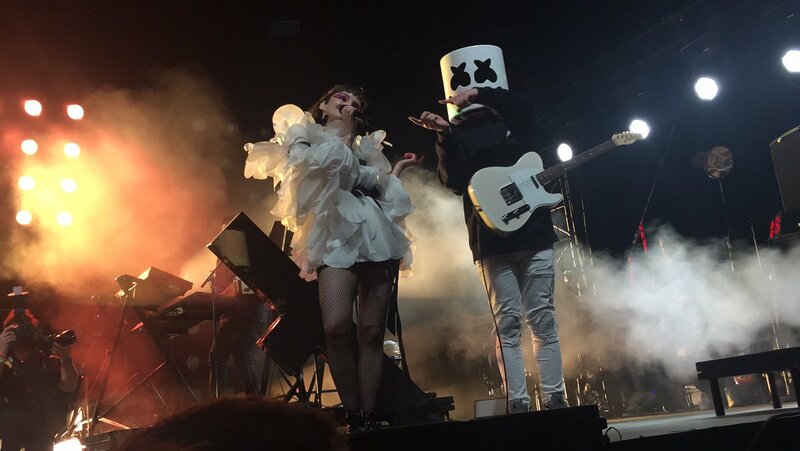 Immediately after, marshmello made his way over to CHVRCHES set to perform their “Here With Me” single live. marshmello ripped the guitar as lead singer Lauren Eve Mayberry bounced across the stage singing the song’s trite, but humble lyrics. It’s a song that is more outside of CHVRCHES’ wheelhouse and certainly penned by marshmello. Mayberry would end the performance on a high note, calling marshmello “the only mysterious man in pop,” before going into the band’s closing number. After his solo performance on the first day of Coachella, Diplo hinted that he had one more set in him at the conclusion of the set, stirring up massive rumor and speculation that reverberated over the valley all weekend. But a simple deduction would point to the on-stage reference as something that would go down at the DoLaB stage, which has historically brought out the likes of Skrillex for its closing surprise sets, among many more big-name acts. All signs began pointing to either LSD, his Grammy-winning side-project with Marc Ronson, Silk City, or Major Lazer. The latter would win out with Major Lazer performing as Saturday’s Do Lab surprise guest, also enlisting Pabllo Vittar and Moonchild Sanelly to bring their reggaeton catalogs to the iconic tent stage, which saw a major makeover this year. The performance was all the more powerful given how Major Lazer is about to put their supergroup project to bed preceding their next album. NGHTMRE closes out Coachella with special guests A$AP Ferg, Lil Jon, and SLANDER. NGHTMRE is just about everywhere these days, headlining every major festival across the world as he sits on the precipice of pop/EDM-crossover. So a Coachella performance only seems fitting. Taking to the Sahara tent in the wee hours of Monday morning, the LA-based producer closed out the entire weekend with a few notable all-star guests. Lil Jon was first to appear, performing classic party anthems, “BANG” and “Shots,” two songs NGHTMRE is known for remixing. Then NGHTMRE invited fellow collaborator A$AP Ferg to the stage, where he delivered “REDLIGHT,” “Plain Jane” and his “Work REMIX” to the crowd. Finally, Gud Vibrations partners SLANDER came onto the stage while NGHTMRE debuted his massive Orb stage production. It’s the same stage that will be following him on his Fall tour.